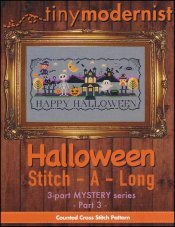 Halloween Stitch-A-Long Part 3 [C5882] - $2.50 : Yarn Tree, Your wholesale source for cross stitch supplies. Cross stitch pattern from Tiny Modernist. This pattern is part 3 for the 3-part mystery series. Halloween pattern featuring a ghost, and owl wearing a witch's hat, a bubbling black cauldron, tombstones, bats, a cobweb, a spider, and a house on a hill. Stitch count for entire piece is 145w x 69h. Companion charts are D6266 Halloween Stitch-A-Long Border & text, W5863 Halloween Stitch-A-Long Part 1, and C6277 Halloween Stitch-A-Long Part 2.